All things considered 2013 has proved to be a very positive year for Purchase.ie. We now have over 300 products in our range to help you counter rising domestic bills and year on year sales have increased by 40% in 2013. This offer is only valid until Monday Dec 23rd at 1pm or whilst stock lasts. In order to avail of it you got to insert the discount coupon code ilovepudding at checkout when placing the order or call us on 01 8428187 and mention the over if placing orders over the phone. 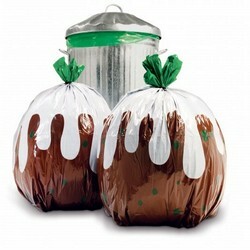 These wonderful seasonal bin bags are 70 litres in size, come in sets of 12 bags each and make for great Santa sacks.